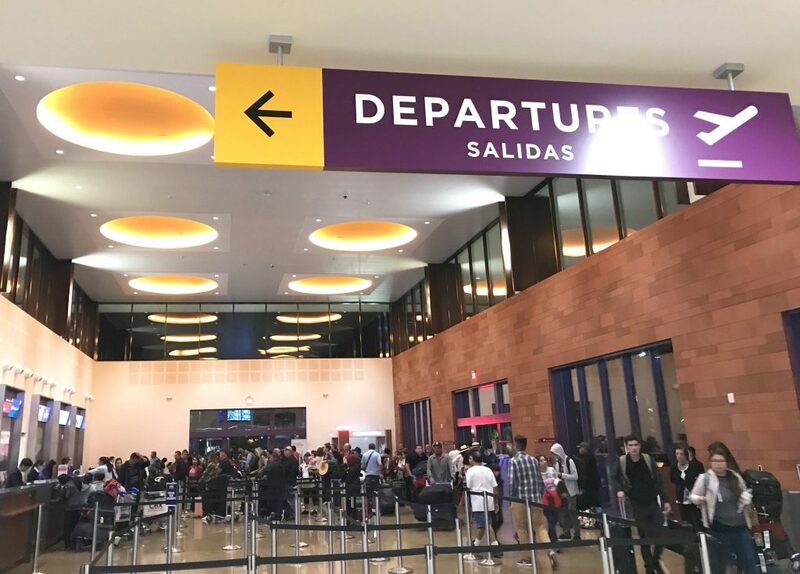 After flying out of Tijuana Airport multiple times now with great success and ease, we’re really happy we discovered how easy and inexpensive it is to fly from Tijuana Airport via the CBX Cross Border Xpress. 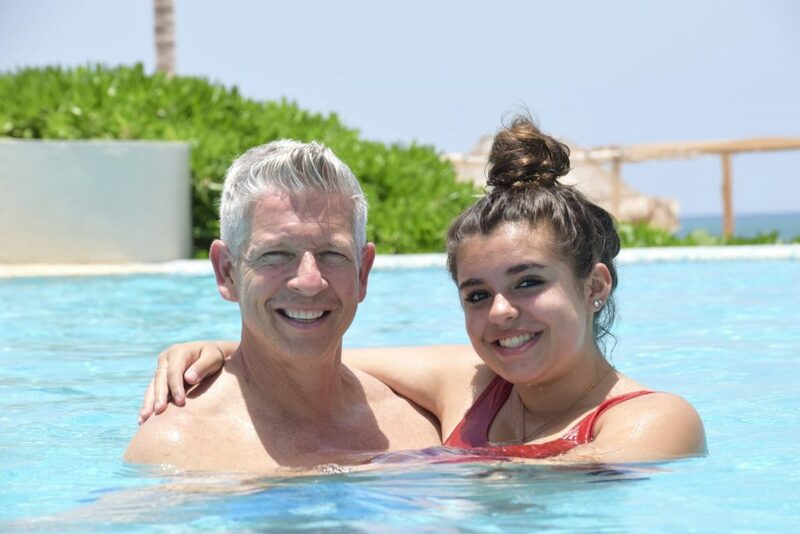 On a recent trip to Playa del Carmen/Cancun, our family saved almost $700! As prices for airfare have continued to soar (excuse the pun) we’ve expanded our view to include Tijuana International Airport. Really, San Diego is a two-airport region now. With so many people from the area traveling to points around the world from here, we can see why the TJ airport is flourishing. And now with a modern renovation and upgrades to passenger terminals, the airport is really world class. It’s always been cheaper to fly to other cities in Mexico from the Tijuana Airport, which is located just feet across the US/Mexico border. It just wasn’t always easy to get there until they built the CBX Cross Border Xpress. The CBX Cross Border Express building is beautiful, clean and easy to navigate. Before I go on, please know that flying from Tijuana is completely safe and very US-friendly. If your family is anything like ours, you might have felt a little dubious about bringing your family across the border to fly from Mexico. CBX could not be safer, and you walk inside the building and across the bridge directly into the airport. No lines at the border, no walking across and then having to catch a taxi to the airport. Our experience was flawless. General Abelardo L. Rodriguez Tijuana International Airport (TIJ) is located just across the border from the US, near the Otay Mesa Border Crossing. It is one of the busiest airports in Mexico, and handles domestic and international flights 24 hours a day. When traveling from TIJ, we’ve had great experiences booking tickets directly on the websites of Aeromexico and Volaris Airlines. There are language options in both English and Spanish. The terminology and instructions are all the same as booking with a US carrier. 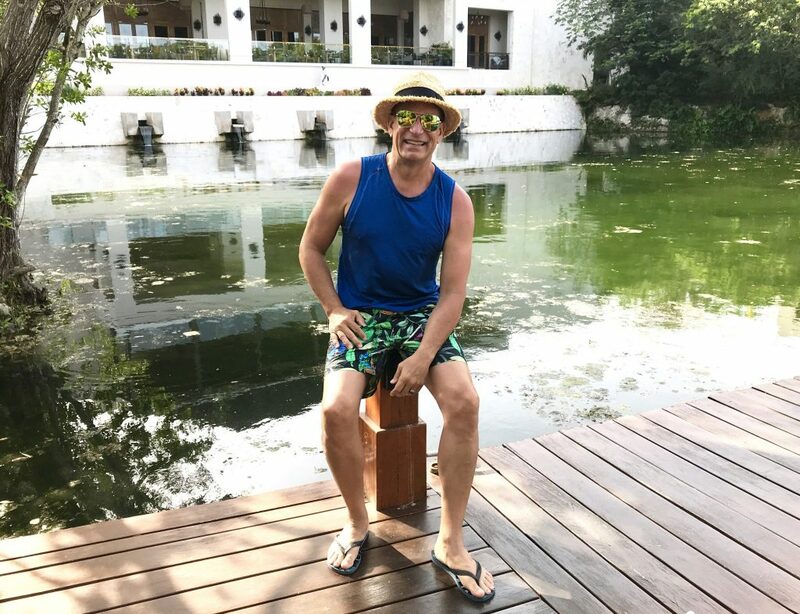 Recently, we had a fabulous vacations at the Grand Velas Riviera Maya and before that the Fairmont Hotel Mayakoba, both in Playa del Carmen. When comparing flights from Tijuana to Cancun versus San Diego or Los Angeles, there was a remarkable cost savings. We ended up buying tickets on Aeromexico from Tijuana to our final destination at Cancun Airport. The difference in cost for a family of four was hundreds of dollars, which we were happy to save! As of April 2019, a quick price comparison shows that a flight on Volaris from Tijuana to Cancun starts at $233 USD. 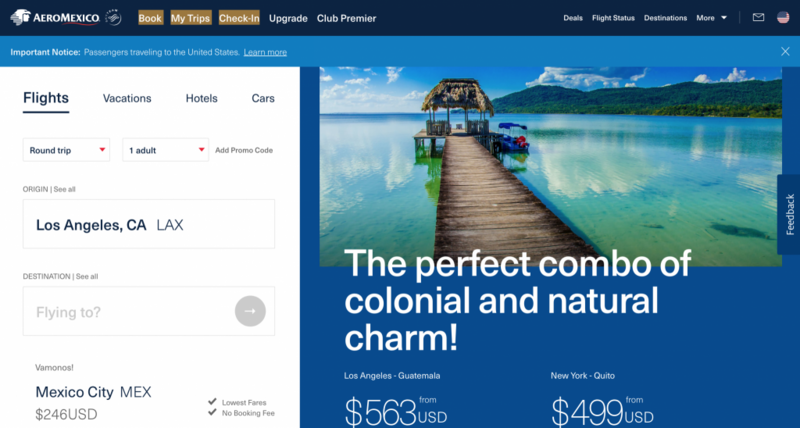 To fly the same itinerary from San Diego to Cancun, we would pay $400 per ticket minimum. For a family of four, those extra dollars really add up! We saved almost $700!! 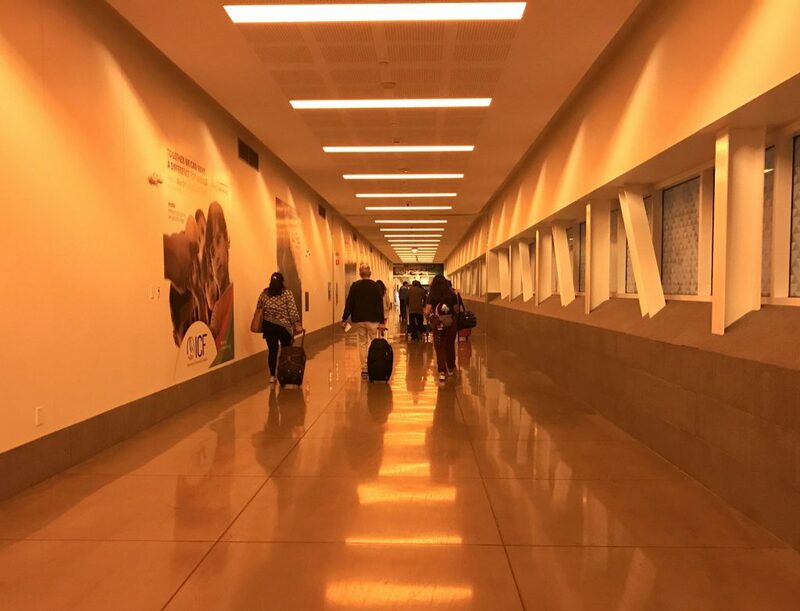 Even more compelling, a new cross-border pedestrian bridge was recently completed that connects directly into the Tijuana Airport. The Cross Border Express buildings on the US side are architecturally gorgeous, spacious and squeaky clean. We walked right up to the CBX entrance, processed our customs paperwork, and sailed through to our gate. The process at CBX was ridiculously easy (and faster than San Diego Airport to be sure). We followed the simple directions to the CBX location, parked our car in their convenient lot for $15/day, and checked into our Aeromexico flights on the US side of the border. We paid the $14 per person fee and then walked the short distance across the border using the elevated bridge. On the Mexican side we cleared security and customs in about 10 minutes, and walked directly into the gate area of the Tijuana Airport. As we walked across the bridge from the CBX building, we crossed the border and arrived in the Tijuana Airport. The whole process took less than 30 minutes from start to finish. We were astonished to find ourselves with too much time in the waiting area for our flight, which NEVER happens in our family. (It’s usually the opposite, because someone is always rushing to pack that last thing). 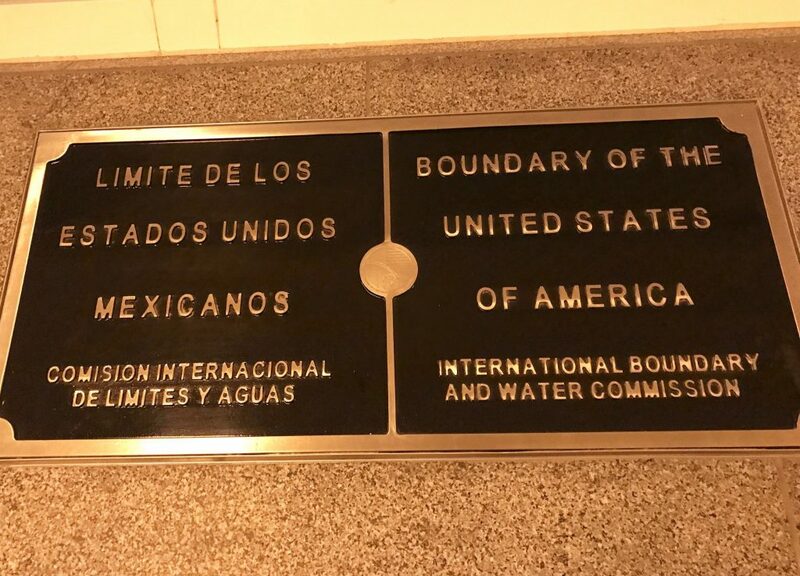 You can literally play Hokey Pokey on the boundary line inside the CBX Bridge between the US and Mexico. Compare this to another experience when our family flew to Cancun, Mexico out of San Diego airport the year before last. We had to check in at San Diego Airport, show passports and fill out immigration forms, fly out of our way to Dallas, connect to a different flight, and eventually arrive in Cancun. We went through customs in Cancun, which took forever due to the crowds of visitors coming from all over. The amount of time in lines was staggering. 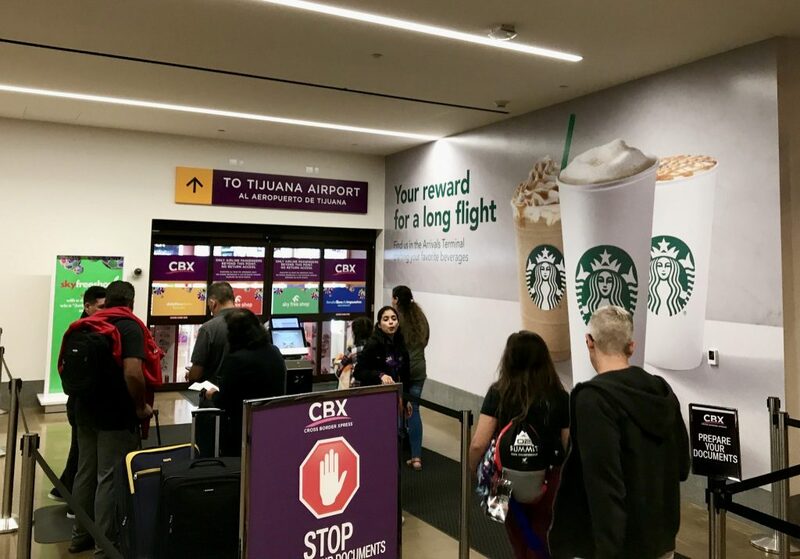 With the CBX Cross Border Xpress experience, we cleared customs and immigration within the bridge connection before entering the Tijuana airport, and sailed through check-in, security and onto our Aeromexico flight deeper into Mexico. I highly recommend this travel option – we will definitely do it again. Hopefully soon! Flying out of Tijuana Airport via CBX Cross Border Express got us to the Fairmont Hotel Mayakoba all the faster! Wow that sounds really easy! We’ve heard so much about the advantages of flying out of TJ and have never taken advantage of it. Thanks for documenting how easy it is. Super easy! You have to let us know if you try it! Sounds easy and your explanation makes it sound reassuring, going to SMA through CBX tomorrow and will let you know. Have a great trip! Can’t wait to hear about your experiences. I hadn’t been to Mexico City for about 25 years, and that initial trip was not my favorite. (Suffice to say I had eaten something that did not agree with me.) All I can remember from that trip is a pink sea of Pepto Bismol. So I was really excited to visit Mexico City again, knowing the city has changed and advanced so remarkably. 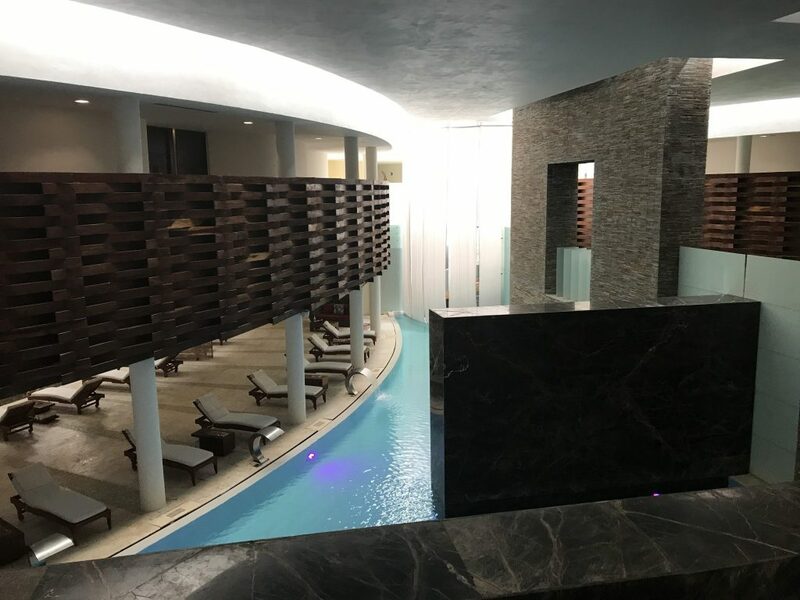 We booked rooms at the luxurious Live Aqua Urban Resort in Mexico City for our recent trip, and I can’t wait to go back. In fact, many friends have visited Mexico City recently and every single one comes back singing rave reviews about the food, people, culture, and architecture. And it’s all true. 26 million inhabitants, and somehow CDMX (Cuidad de Mexico) makes it all work. 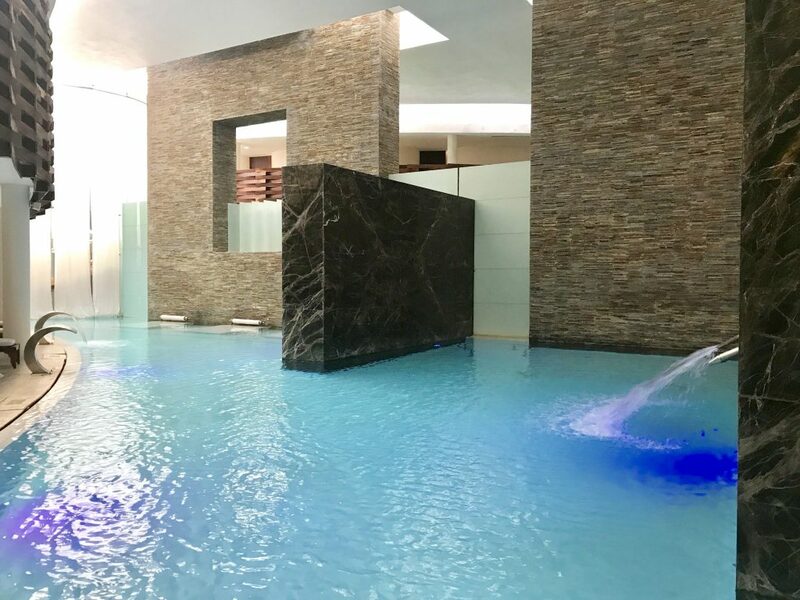 There are plenty of nooks and crannies in which to sit around the lobby of the Live Aqua Urban Resort in Mexico City. This world-class city reminds me of a cross between New York and Paris. There are huge areas of the city crisscrossed by wide avenues with parks and tall trees down the middle. Sidewalk cafes spill out from buildings of historic architecture, with sophisticated and extremely well-dressed men and women strolling, dining and discussing. 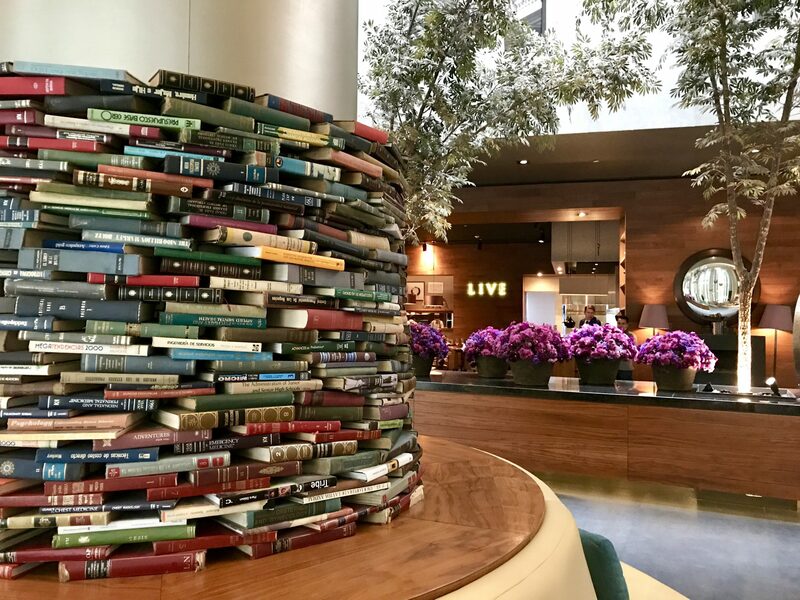 This interior column in the lobby of the Live Aqua Urban Resort is artfully decorated with books as a design feature. Interspersed with all this, tall and architecturally significant skyscrapers of gleaming glass and impossible angles dot the skylines of this surprisingly hilly city. Yes, like any large city there are areas of poverty. Driving through the roadways from the airport into town, we viewed neighborhoods of working people struggling to create better lives for themselves and their families. There is a broad difference in Mexico between the have and the have-nots, and many good residents of Mexico City and other areas are working hard to close this gap. 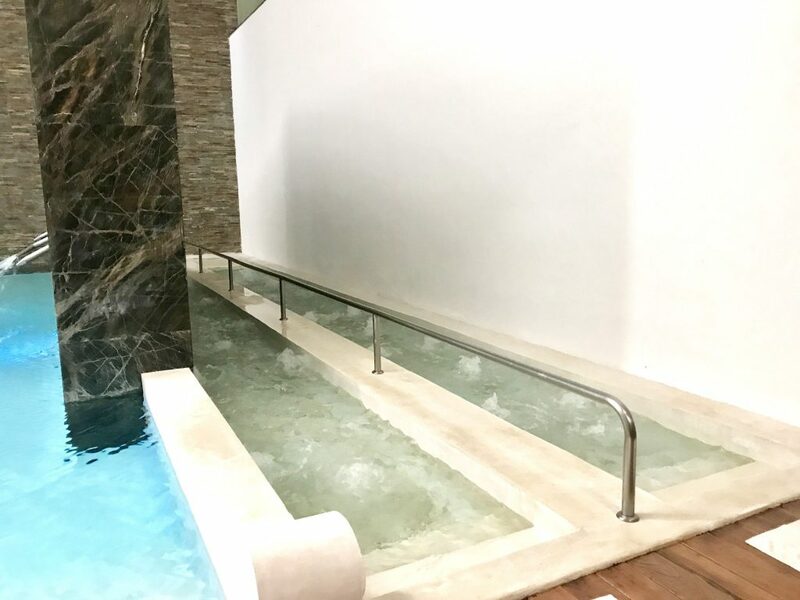 In the Bosques de las Lomas neighborhood just near the famed restaurants, galleries and history of the Polanco area, Live Aqua Urban Resort welcomes discerning guests. 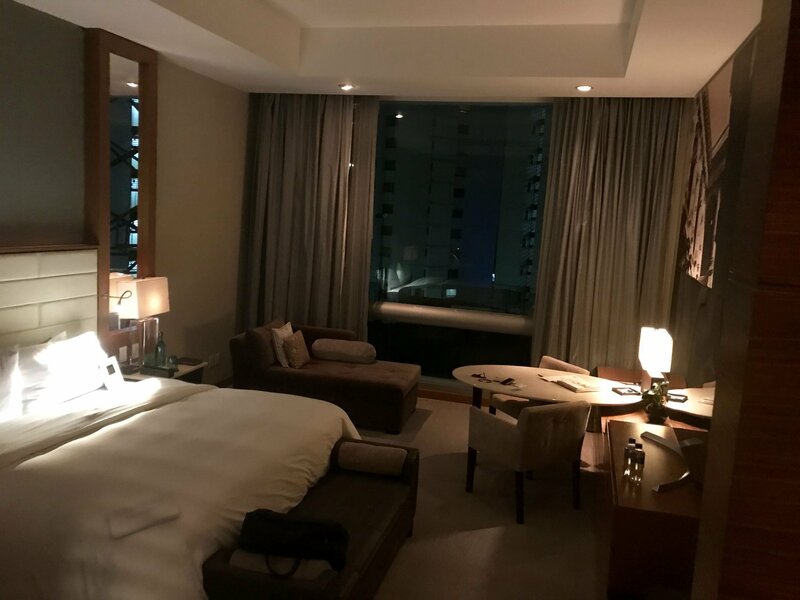 Urban Resort is a good moniker for this hotel, because its location connected to a mall and business park is not a typical tourist experience. 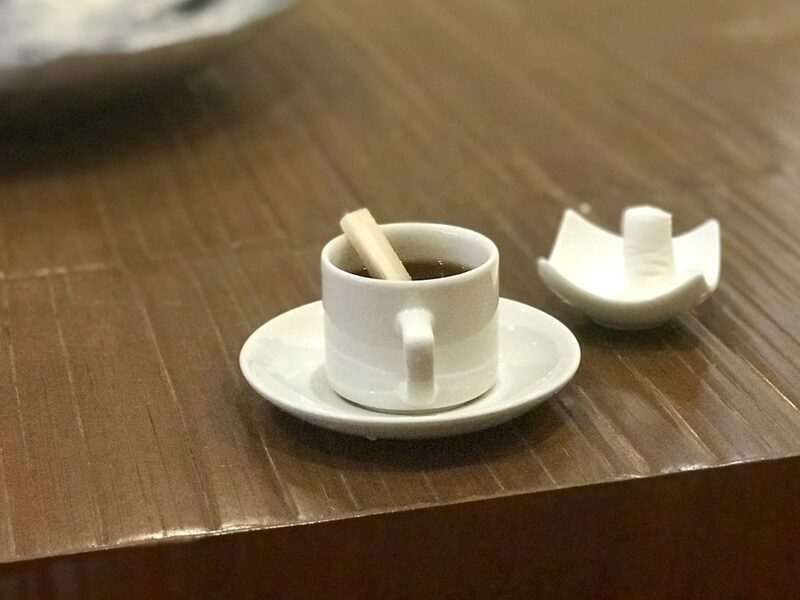 In fact, the hotel is more geared for international business people. No pool, no playground, no kids. Just off the main lobby of the Live Aqua Urban Resort, the patio bar is stylish and private. 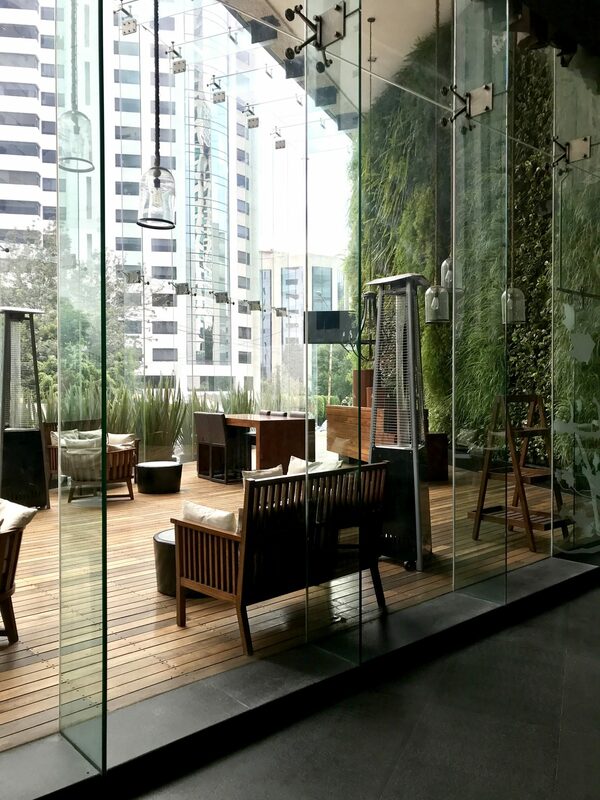 Connected via glass-enclosed footbridge to a high end shopping mall with world- class restaurants, Live Aqua Mexico City delivers a 5-star luxury experience. The lobby and public areas in Live Aqua are just stunning. Entering the lobby, I didn’t know where to look first since there were so many interesting things to see. Gigantic columns are wrapped into the design with whimsy, including one surrounded by seating and sheathed in a stack of real books. An interior reflecting pond and open seating areas are located to the right near the registration desk. To the left, the lobby bar spills out on to an outdoor deck with interesting wood accents. Enormous billowing drapes of cloth hang in curvy rows from the ceiling, a design feature that made me feel under-the-sea. And in the back, the hotel’s signature restaurant and open kitchen are tucked behind impressive florals. Really, I could have sat in this lobby to drink in the design for hours. 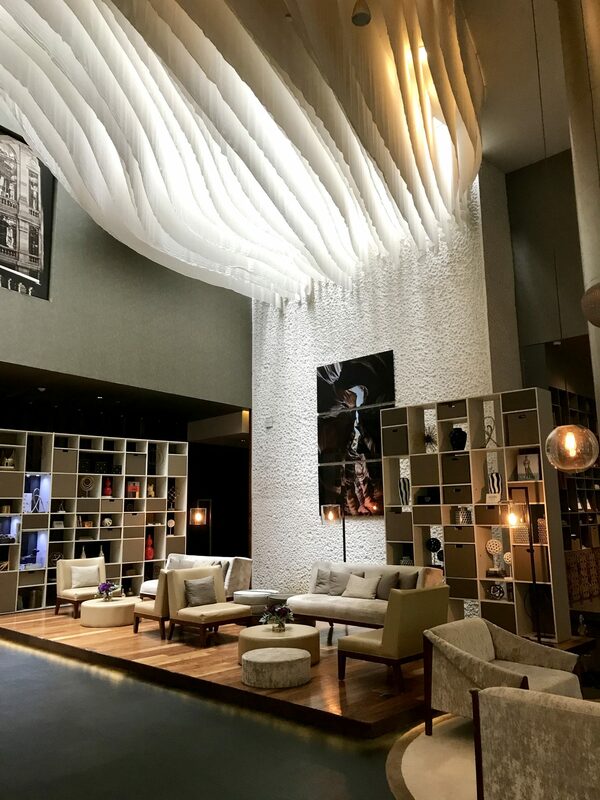 The gorgeous lobby at the Live Aqua Urban Resort is a feast for the senses. Not to be outdone by the lobby, the guest rooms continue this theme of high design. More subdued than the public spaces, the rooms are decorated in warm woods and muted colors. Since the views from the large windows don’t offer anything exciting, the room takes over in the visual department. Every detail was perfect, every corner, every cabinet latch, every amenity – all perfection. 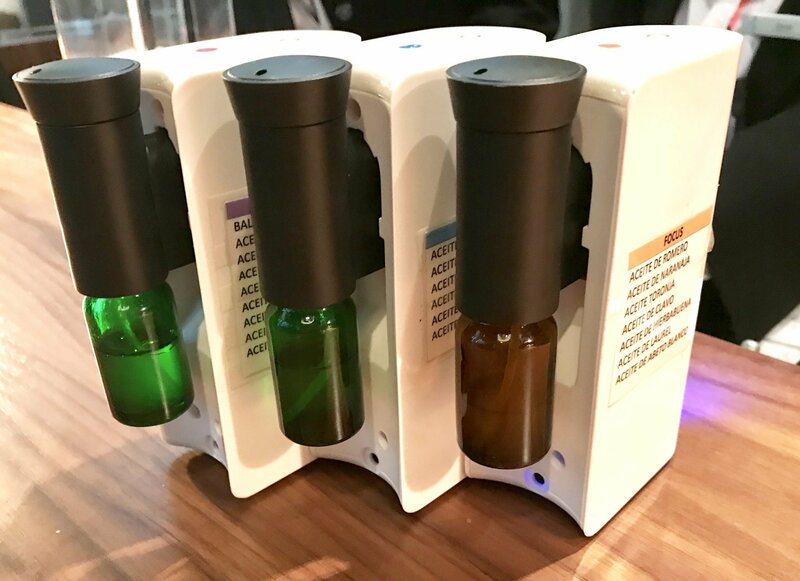 At check-in, the staff even asked me what organic scent I would prefer in the room – mint, chamomile or citrus. I chose chamomile for relaxation. Guests are asked if they would like to pick the scent of their room at Live Aqua. I chose “Relax”. I don’t know about you, but I’m really picky about hotel beds. The mattress has to be the right combination of hard and soft, and the linens have to feel like butter. Oh and the pillows? When they are too hard, it feels like I’m trying to rest my head on a sand bag. Too soft, and my neck gets zero support so I wake up with a crick. But Goldilocks would have been happy with this bedding, and so was I. It was juuuussst right. Muted colors and warm woods are accented by soft white bedding at Live Aqua Urban Resort. 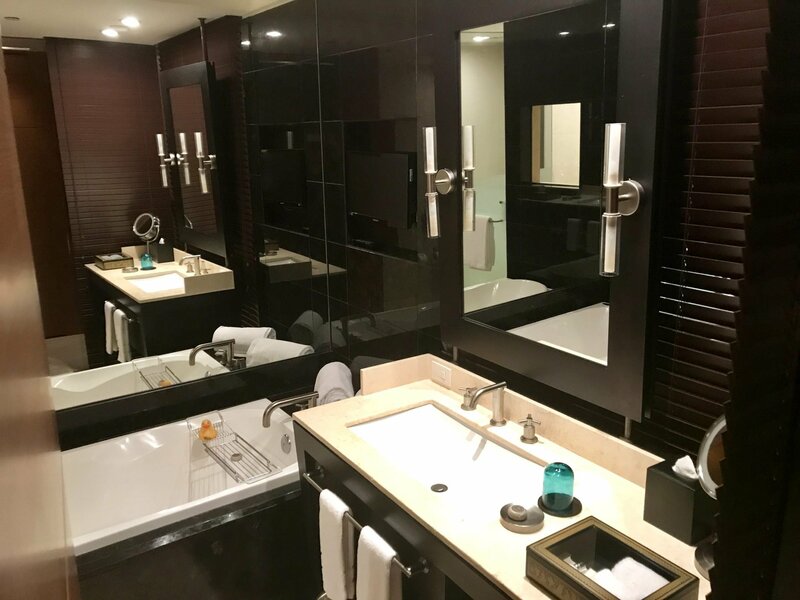 A true design feature in itself, the bathroom in my room at Live Aqua Mexico City was as large as some bedrooms. The wall and corner facing the bedroom was floor to ceiling glass, covered with wooden slat shades you can raise or lower at your whim. I positioned the louvers open to let in natural light, and checked to see that no one from outside could see me naked. (They couldn’t). Even the bathrooms at Live Aqua CDMX are stunning examples of design. Also floor to ceiling glass on two sides, the enormous walk-in shower had a rainshower head and luxury bathroom amenities. If you like baths, you will love this bathtub which would easily fit more than one person. 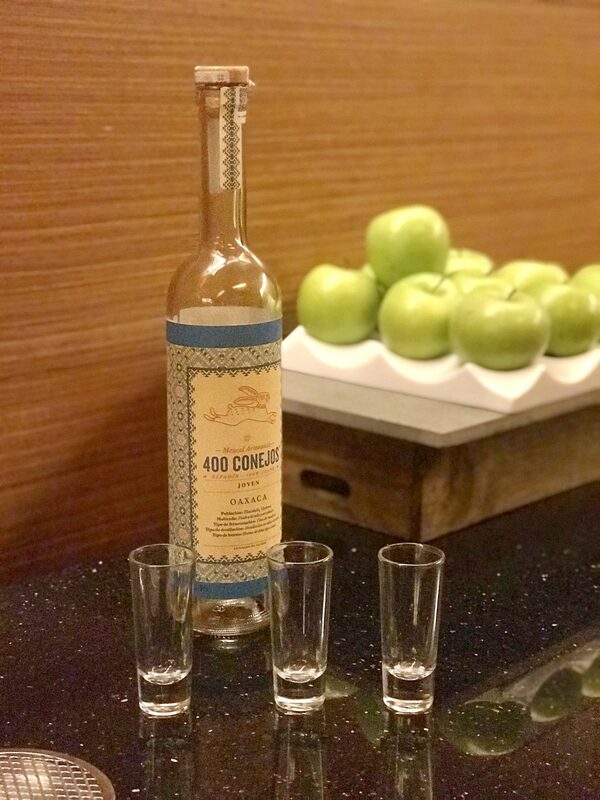 A little sip of 400 Conejos Mezcal is available in the elevator lobby of each floor at the Live Aqua Mexico City. In my room, filtered water was served in a colored glass bottle with cork. Nearby, a zen-inducing sand box with rake was available in case I needed stress relief. All the appropriate plugs and outlets are available to charge my devices, and the hotel WiFi is free. Rooms at Live Aqua Urban Resort start at $174 USD. The hotel is located on the other side of downtown Mexico City from the airport, so plan on about an hour with light traffic to get there. Traffic in this city can be pretty jammed, so give yourself proper time to get anywhere. If I return to Mexico City on business, I will absolutely book at Live Aqua again. I learned they have hotels in other Mexico destinations, so I’m absolutely going to take a look at those too. Can’t say enough good things about this fantastic hotel. 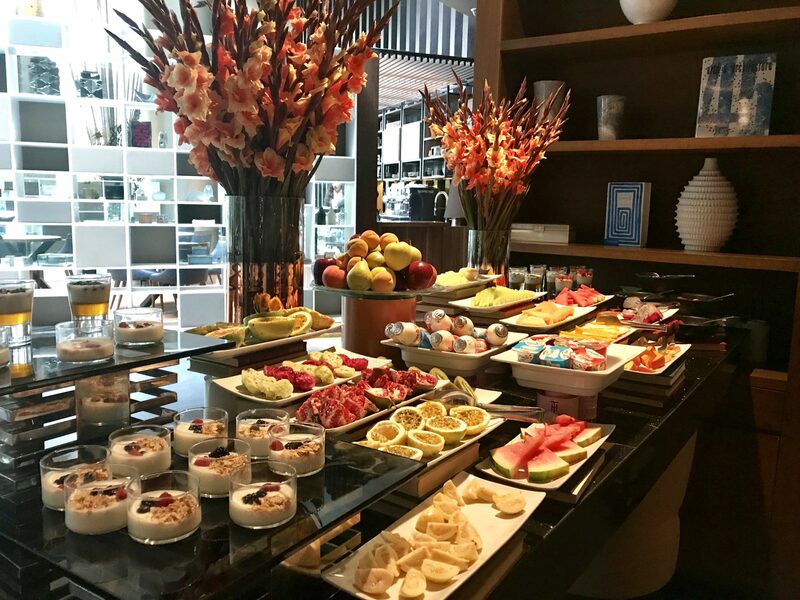 Each morning, the breakfast buffet they set out at Live Aqua Urban Resort is overwhelming and delicious. 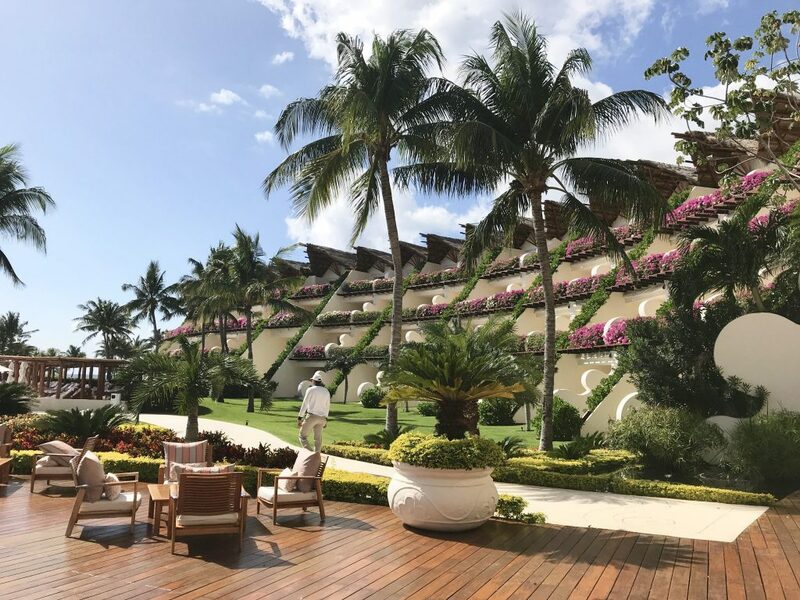 *Our visit to the Riviera Maya was hosted in part by the Fairmont Hotel Mayakoba, and we are grateful for the experience. As always, the content and thoughts expressed here are our own. On a great family vacation to the Riviera Maya recently, we had the opportunity to try something out of our comfort zone. One evening our hosts at the Fairmont Hotel Mayakoba asked us to an insect dinner party. That’s right, we eat insects. Well more precisely, Triton and Jon ate insects while Sophia and Ava gagged at the thought. We did get to wash this feast down with a healthy tasting of Mezcal, so we learned, tasted, laughed and grimaced. 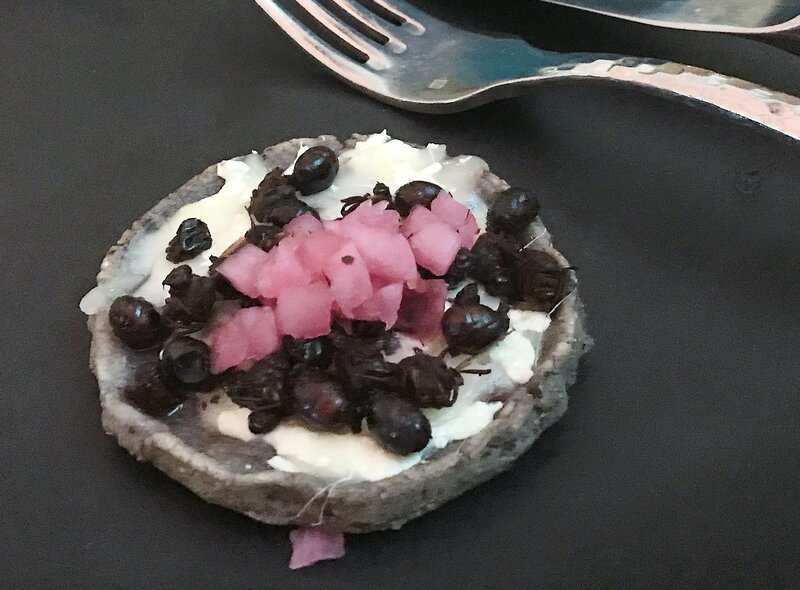 Turns out eating insects and tasting Mezcal in Mexico is pretty darn fun – and delicious! Now let’s correct any of your pre-conceived notions right up front. We did not eat live, slithering bugs like some twisted episode of Fear Factor. 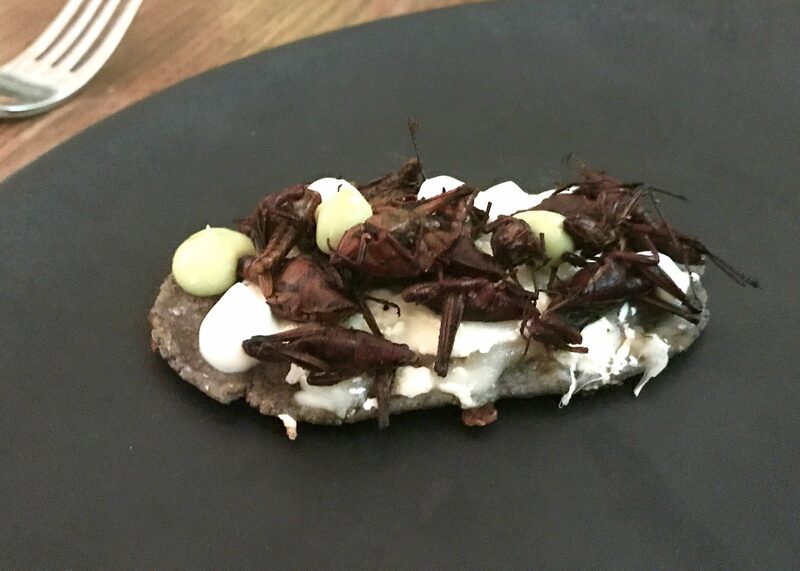 These insects are a delicacy in Mexico, thoughtfully prepared by the Fairmont’s Chef Fernando in very artful presentations. Although maybe not for the squeamish, we were game. We sat down inside La Laguna restaurant, ready for anything. Chef Fernando brought his insect creations to our table, while we warmed our palates with shots of mezcal. In Mexico, people have been consuming insects throughout history, first as an important source of protein since meat was scarce. Now in many nice restaurants, insects have become a delicacy prepared carefully with other tasty ingredients. Honestly if you can get past what you are actually eating, the overall combinations are really quite good. The Fairmont Mayakoba has become well known for their culinary masterpieces created with insects. The experience is available for $75 per person, and pairs three dishes with a sampling of Mezcals. Our sampler platter of edible insects was colorful and delicious. These are the largest and probably hardest to overlook as actual insects, with little legs clearly visible. Prepared by boiling and then frying, they crunch in your mouth like a tortilla chip but softer. These little grasshoppers are fairly common, and are organically raised on farms feeding on only the best alfalfa. 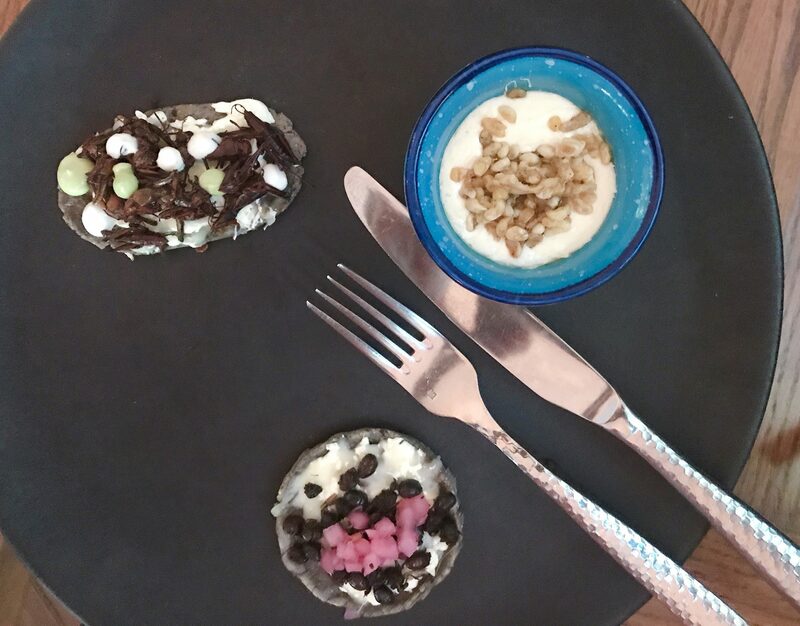 At the Fairmont Mayakoba, chapulines (cha-poo-lee-nays) were served atop a blue corn tortilla, dotted with sour cream, avocado puree and crumbly white cheese. The crunch of the insects is complemented by the creamy sauces and the rich corn flavor. It was really quite good. We each ate the entire serving, while the girls squirmed. (They were served cheese quesadillas). These grasshoppers still had their legs and antennae, but they tasted fantastic. Tiny white capsules, escamoles are look much like risotto in appearance. Difficult to harvest and only available a short time during the year, the ant eggs are considered a true delicacy. Escamoles (es-cah-moe-lays) are often called “Mexican Caviar” for their appearance and expense. Our tasting experience had the Fairmont serving them up atop a savory cheese pudding-like concoction. Meant to be consumed at room temperature, this one had a consistency some might find difficult. Triton found it unappealing and did not taste it more than once, but I liked it. The escamoles tasted buttery and soft, blending with the cheese for a pleasant bite. These little guys are actually leafcutter ants that are found in the wild all over the Yucatan. They are pretty large in comparison to American house ants. To prepare the chicatanas (chee-kah-tah-nahs), they pull off the legs, heads and such. Although toasted to a crunchy crisp, their bodies still delicious for eating. With the legs and heads pulled off, these ants just look like raisins. Kind of. Our servings at the Fairmont started with a blue corn sopapilla (soft, thick tortilla-like), with a crema and cheese. The chicatanas were placed on top, and then garnished with pickled something – I think they were diced radishes. This one was my favorite and I scarfed it right down. Of course, we ate this one last and had been tasting several bottles of mezcal, so that might have helped! While we were working up the nerve to eat the insect concoctions, a very nice gentleman from the bar was instructing us on the finer points of Mezcal. Tequila is a type of mezcal, made only from a certain type of blue agave plant only grown in the Jalisco region of Mexico. Anything else in this family of liquor is called Mezcal, and there are hundreds upon hundreds of varieties made in Oaxaca and all over Mexico. 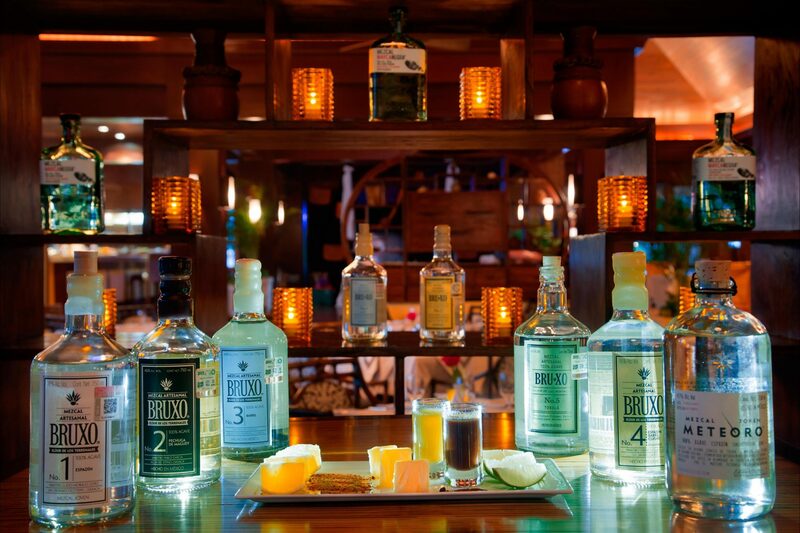 Tasting Mezcal and Tequila in Mexico is like sampling fine wines. I always thought ALL mezcals have a strong smokey taste, but I was corrected. All mezcal is created by torching the hearts of agave plants in pits dug in the ground. This process condenses the juices and adds a smokey flavor. Some mezcal is left to ferment with the smoke intact, resulting in a bottle tasting of the fiery way it was processed. Other mezcals begin the same, but are processed, filtered and distilled differently in a way that removes the smoke flavor. Mezcal comes in many colors, just like tequila. It can be crystal clear, honey colored or even dark amber in tone. Not unlike fine wines, each distillery has its own special touches that add flavor tones, nuances and other tastes to their mezcals. Our instructor helped us pick up tones of cherry, chocolate, cinnamon and even juniper among others. The process of tasting five different liquors was hugely enlightening. And delicious. 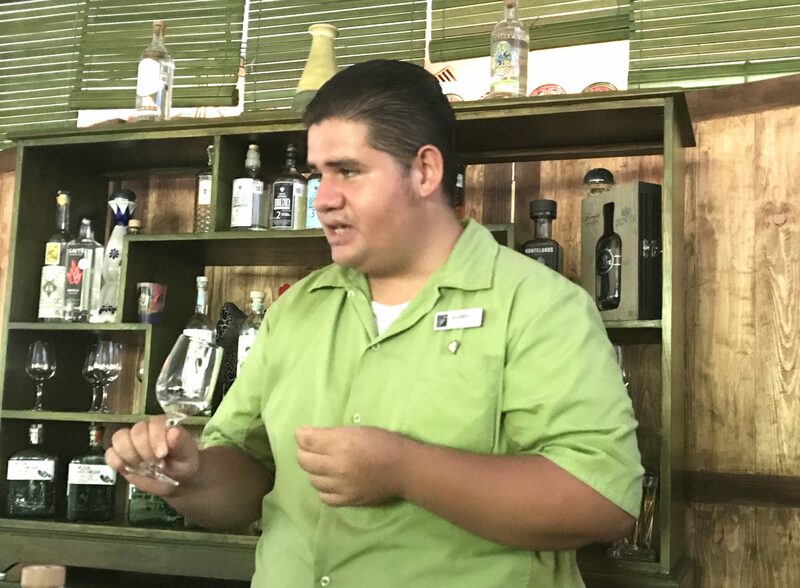 Our leader taught us how to discern flavors unique to each Mezcal we tasted. My favorite mezcal in the tasting was bottled by Gracias a Dios, and was called Tobalá. Triton like the bottle of Gracias a Dios Cuixe. Either way, we left happy! 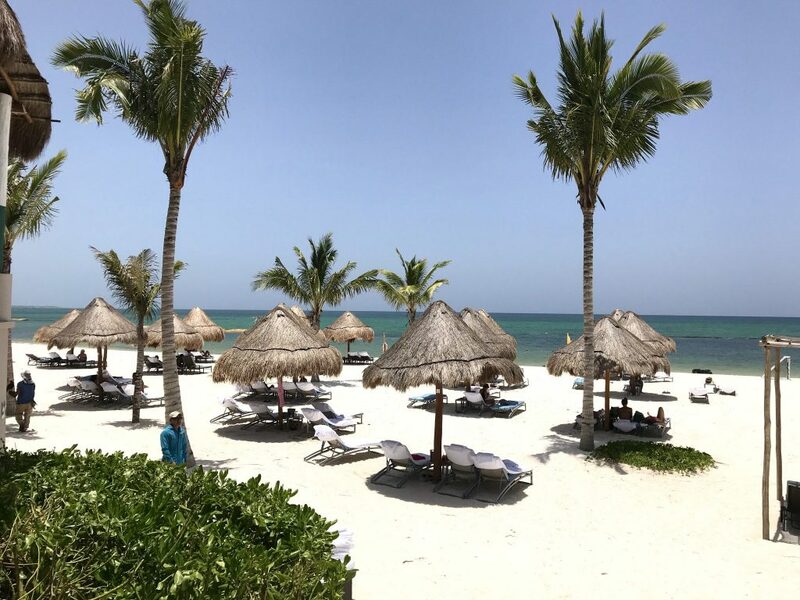 *This experience was sponsored by the Fairmont Hotel Mayakoba and MariturDMC, and as always, the opinions expressed here are our own. As global travelers, our family has always dreamed of visiting all 7 Wonders of the World and now we can cross one off the list. 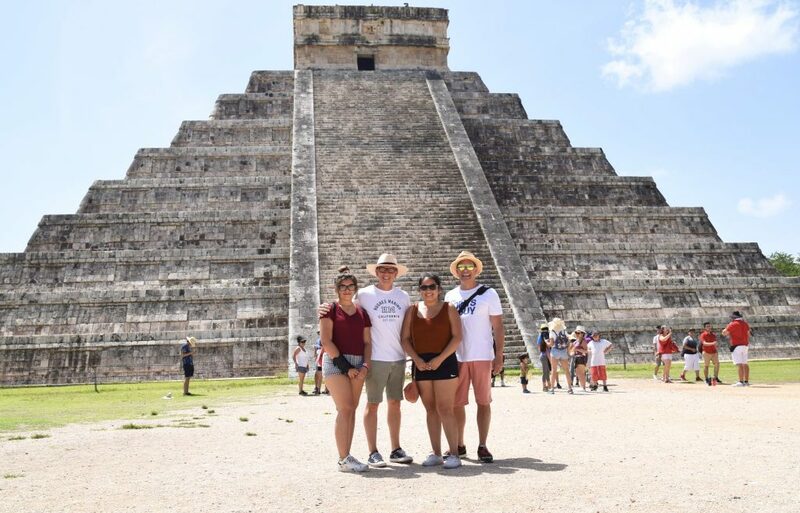 On our recent visit to the Yucatan Peninsula in Mexico, we set out to visit Chichen Itza with kids in tow. These Mayan ruins have withstood the test of time and still remain magnificent in their history and grandeur. It’s an easy and interesting destination with kids. Chichen Itza was originated on this land in around 600 A.D., and is now designated a UNESCO World Heritage Site. It is also named one of the New 7 Wonders of the World. 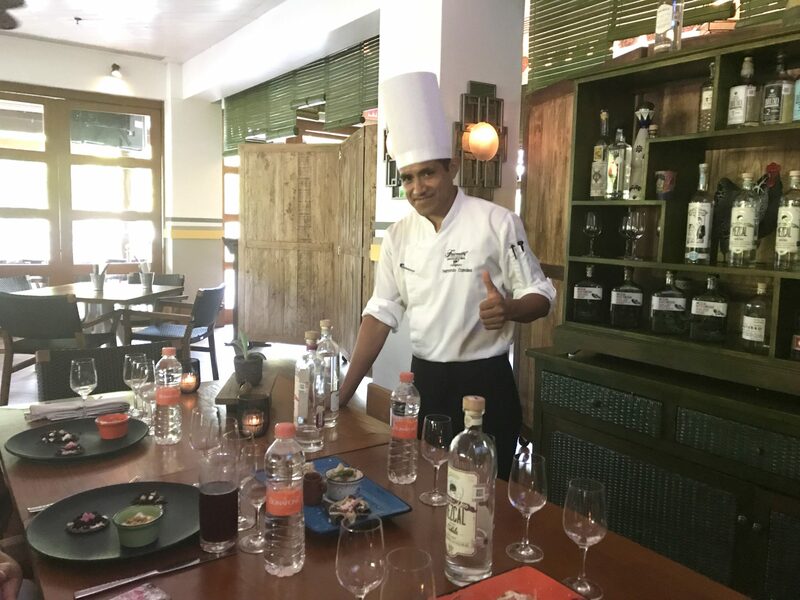 From our luxurious resort accommodations and family vacation at Fairmont Hotel Mayakoba, we hopped into a tour group organized by our very capable Maritur guide, Sergio. We were so glad to take a guided tour to learn much more about this historic site. I think if we tried to visit it ourselves, we would never have come away with so many amazing stories. Besides, the pressure of trying to parent and play tour guide at the same time is just too much for most of us. We prefer to let the professionals handle the guiding! Chichen Itza with kids is a fun adventure for the whole family. We wondered if we could visit Chichen Itza with kids and avoid them getting bored or cranky. The resulting experience was quite enjoyable for all, so the short answer is YES. The drive from the Riviera Maya to Chichen Itza was a little more than two hours. Traveling in a shiny black SUV with AC and phone chargers, our family was a bunch of happy campers. Sergio told us about what we would be seeing, giving us the backstory and history of the site along the way. (The girls had their headphones on the whole time listening to music). Those of us that listened to Sergio learned a ton! Two reasons: crowds and heat. Like many places around the world, Chichen Itza is a popular tourist destination that draws more than 1.5 million people a year. Getting there early will afford you some spectacular photo opportunities before some silly yahoo gets in the way of your perfect shot. Given the right position, we were actually able to get photos with nearly no one in the photos. If you get to Chichen Itza early enough, you can capture photos like this with no people. There are not a lot of trees on the enormous 1280-acre grounds at Chichen Itza. In fact, during its reign the facilities had absolutely no trees at all – all the trees onsite now have grown after the fall of the Mayan civilization. Because of this sunny disposition, it is usually pretty warm here (as in HOT). Bring shade and water with you. I drank two whole bottles of water while we were there, and never needed to pee. The girls actually poured cold bottled water over their heads. 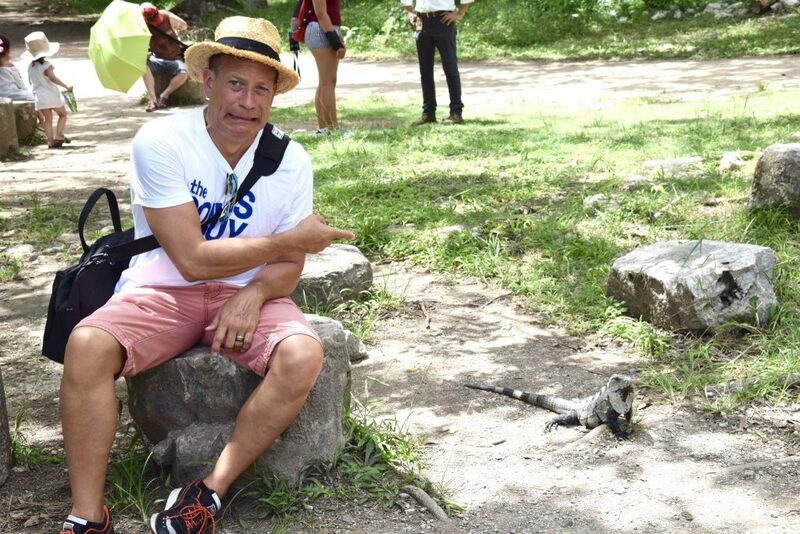 Chichen Itza is literally crawling with iguanas. If your kids are anything like ours, they never say they have to visit the bathroom when you ask them. Then, after you’ve already started your excursion, they announce that they have to pee. Take our advice, visit the restrooms at the park entrance – there are none inside the park and you will be in there a long time. There are also snacks and drinks if anyone is feeling a little peckish after the drive. Best to walk directly to the Temple first and get your photos. We managed to get several shots before people walked into the frame, and were happy with the results. Also, listen to you tour guide because he/she will give you a rundown on the significance of what you are seeing. 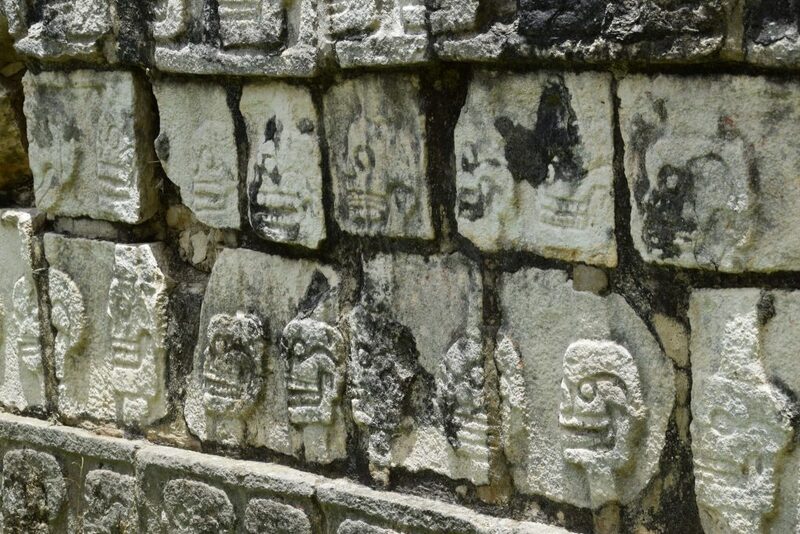 Yes, those are skeleton heads carved in this wall at Chichen Itza to honor the ancient Mayan tradition of human sacrifice. For example, when looking at the temple you see steep stairs on all four sides of the pyramid. Except those are not stairs. They were built as part of the human sacrifice rituals that took place at the top of the temple. When the priests would behead the people being sacrificed, they would roll their heads down those “stairs” to the waiting masses below. Fun times! The entire campus at Chichen Itza is enormous, with so many interesting buildings and architectural monuments to see. Plan for your visit to last about three hours at least. With so many buildings and places of significance, it may seem easy to become overwhelmed. Actually with a tour guide the layout all made sense, and we knew what we were looking at. Sergio narrated while we walked, and we got a crash course in Mayan history, culture and people. 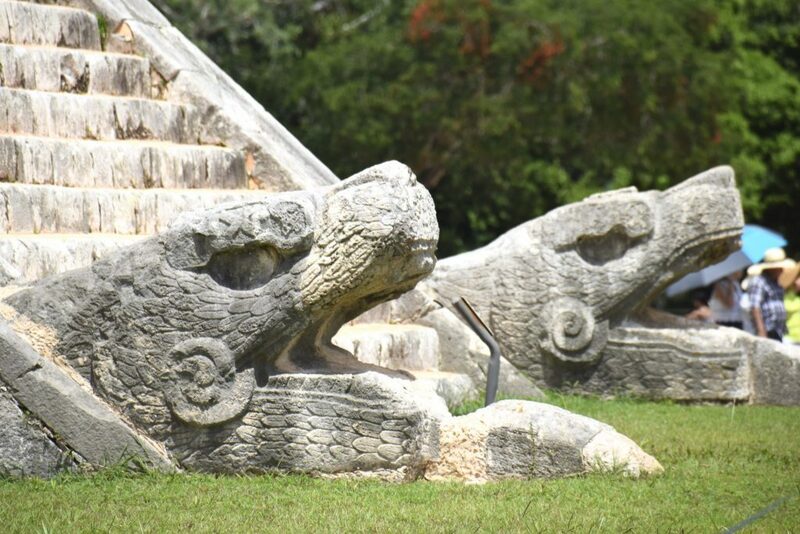 The serpent was worshipped as an important cultural symbol at Chichen Itza. 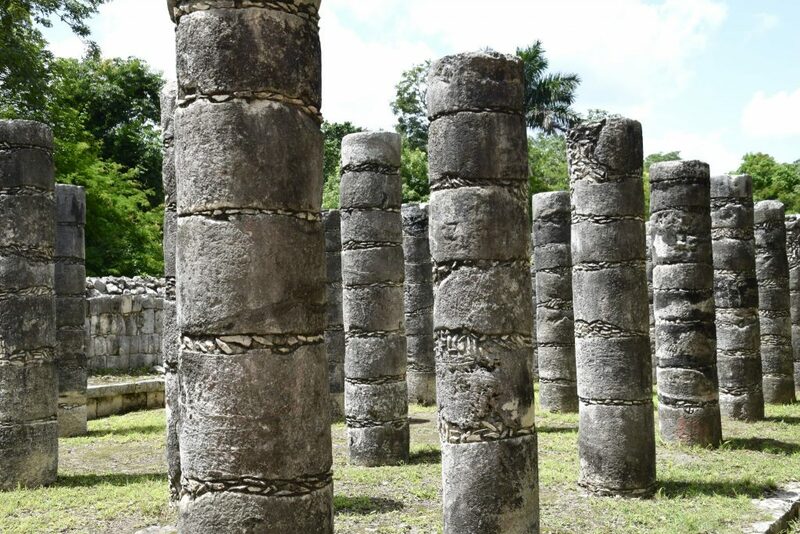 This columns are what remains of Chichen Itza’s version of a shopping mall. The kids were automatically drawn to it. After our tour, Sergio took us to the nearby Sa’amal Cenote near the town of Valladolid. This is an ancient cave now filled with fresh water, complete with fern covered walls and tropical fish. We were so happy to cool down in the clear, fresh water and splash under the waterfall. I even got brave and jumped off a platform some 25+ feet into the water – it was a blast. There was something very special about this swimming hole, knowing it has been here for thousands of years. After our tour of Chichen Itza with kids, we swam in the incredible Sa’amal Cenote nearby. Our family highly recommends this excursion while you are visiting the Riviera Maya. 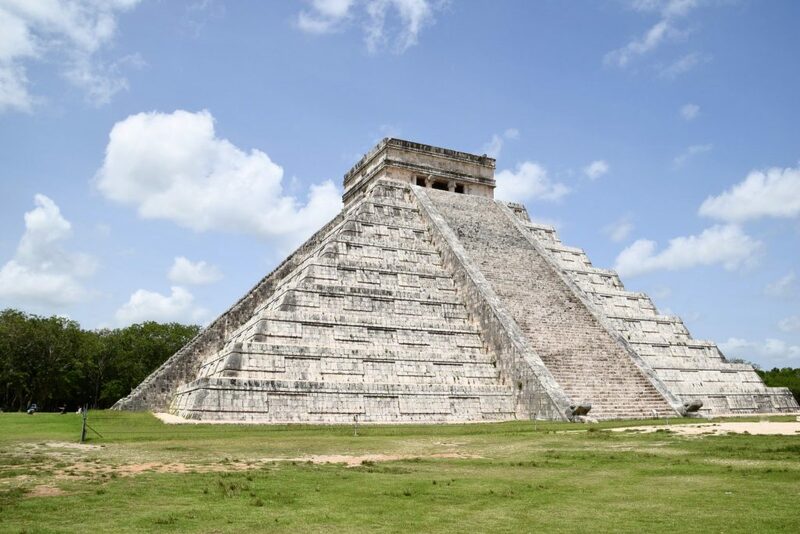 If you are staying at the Fairmont Hotel Mayakoba, they can arrange the tour for you so you can visit Chichen Itza with kids and enjoy the entire experience! 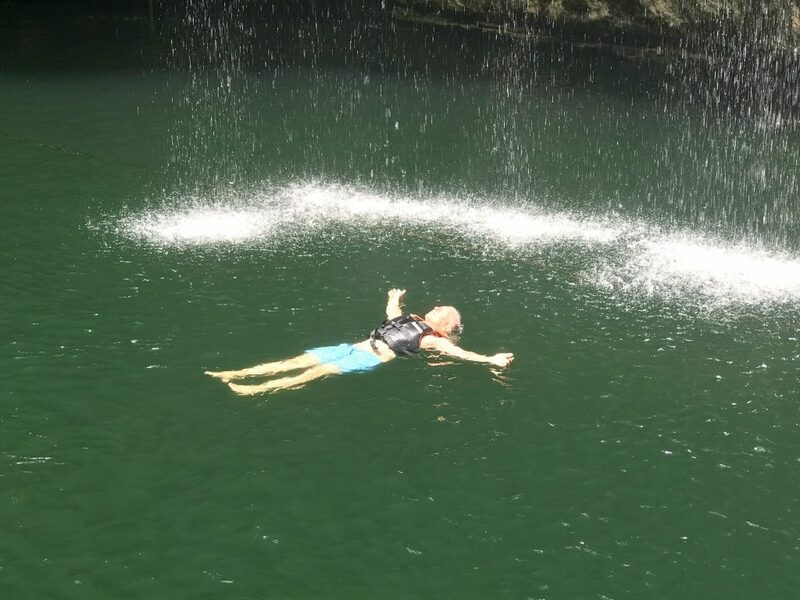 The fresh, cool water of Sa’amal Cenote was so delicious that Triton had to float under the waterfall sprinkles. I read your article. This post is very good and mind-blowing. Thanks for sharing this attractive pictures and this post. 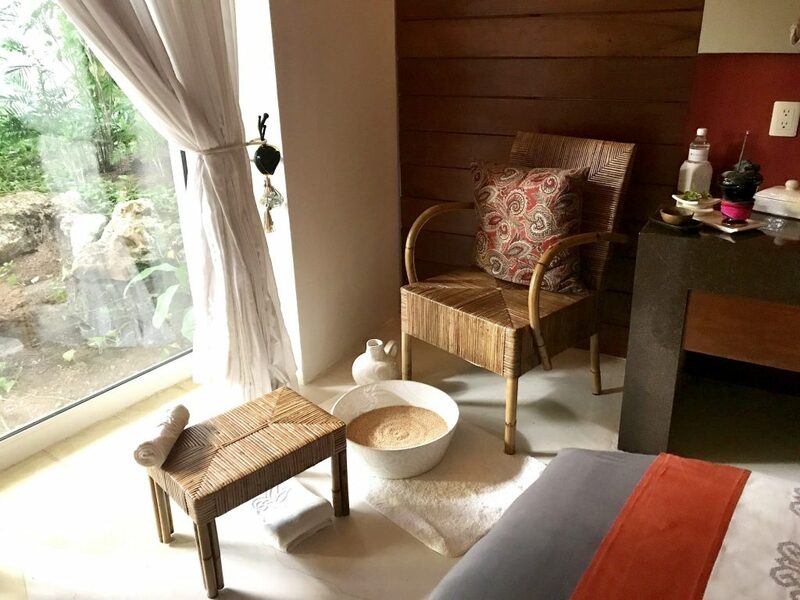 *This experience was sponsored by the Fairmont Hotel Mayakoba, and as always, the opinions expressed here are our own. When we told the kids we were going back to Playa del Carmen in Mexico, they nearly jumped up and down with excitement. We were there a couple of years ago with two other families, and had so much fun exploring the Caribbean side of Mexico near Cancún. However, this recent visit promised to be even more spectacular. After all, we would be enjoying our family vacation at the 5-Star Fairmont Hotel Mayakoba on Mexico’s Riviera Maya. Beach palapas with comfy lounge chairs await guests at the Fairmont Hotel Mayakoba. 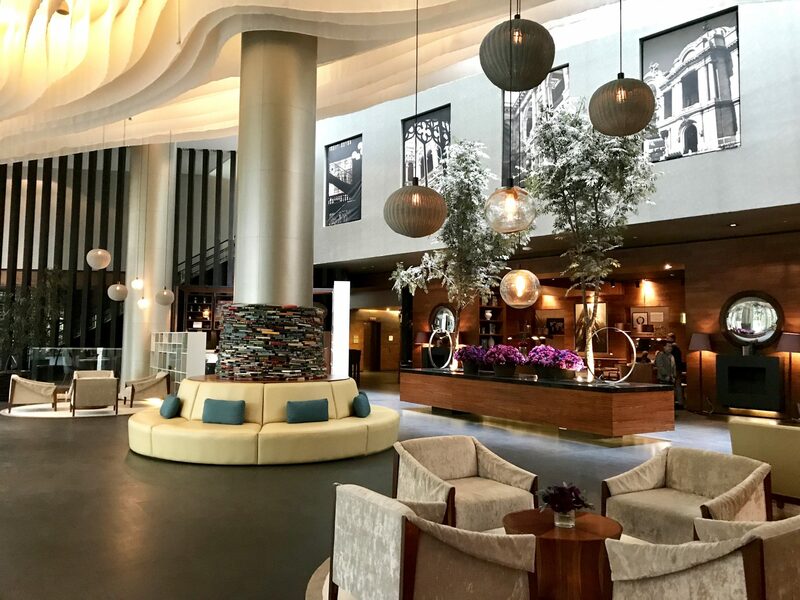 We’ve loved our stays at other Fairmont Hotels in the past, including the Fairmont Hotel Claremont in Berkeley, and the Fairmont Olympic Hotel in Seattle. But I gotta tell you folks, the luxurious Fairmont Hotel Mayakoba topped them all. It was absolute paradise on the Caribbean oceanfront, and an ideal place for a family vacation to unwind, relax, play and explore. Good bits of all those things were accomplished, and more – read on for details! First, let’s get something out of the way. Mexico and Playa del Carmen are absolutely safe places to visit for Americans. There is no more reason to worry about traveling to the tourist areas of Mexico as there is traveling to any major city in the US. 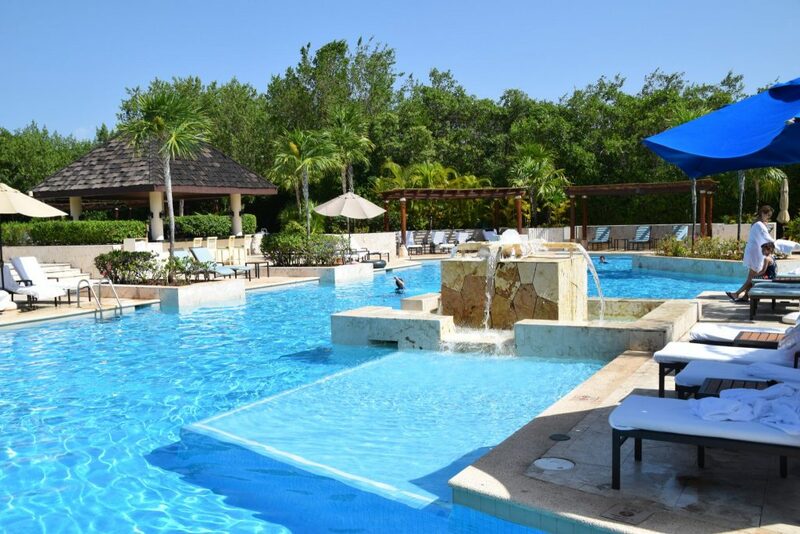 Besides, most of the resorts like the Fairmont Hotel Mayakoba are all-inclusive so you could spend your entire stay at the resort. Our family has traveled many times to Mexico over the past several years, and have always felt 100% safe and secure. There are so many amazing things to see and do here! From the walkway leading to the Fairmont Hotel Mayakoba lobby and El Puerto Restaurant, the evening lights were so beautiful. Lots of interesting day trips to the neighboring sites are easily arranged with the concierge. (We visited the Mayan ruins of Chichen Itza). The main pool at the Fairmont Hotel Mayakoba is so well designed, with nooks and crannies for families to tuck into. There were so many families with kids staying here during our visit. Families were American, British, Dutch, German and Mexican, along with a smattering of other nationalities. Never did our kids feel out of place or unwelcome, even in the fanciest restaurants onsite. The beaches in front of the Fairmont Hotel Mayakoba are pretty epic. Crystal blue water is comfortably warm but still refreshing. There are no waves, so even the smallest kids can run into the sea safely (with parental supervision of course). We must have bobbed around in the water for more than an hour, just floating and chatting and looking for the small fish that darted away from our grasps. 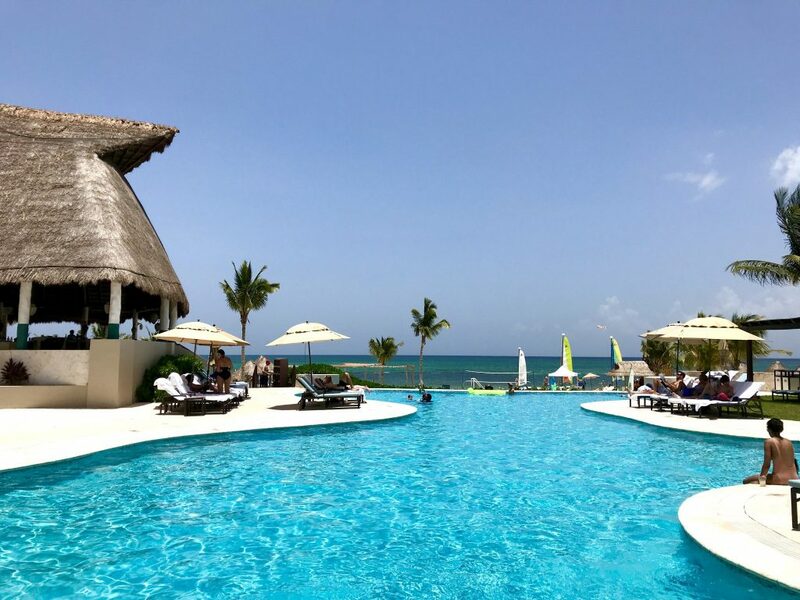 The beach side pool at the Fairmont Hotel Mayakoba has a disappearing edge overlooking the beach palapas and crystal blue ocean. Playing in the beachfront pool at the Fairmont Hotel Mayakoba – could have stayed here for weeks. The Fairmont Hotel Mayakoba is set on some 240 acres of beachfront tropical property, crisscrossed by a series of canals. 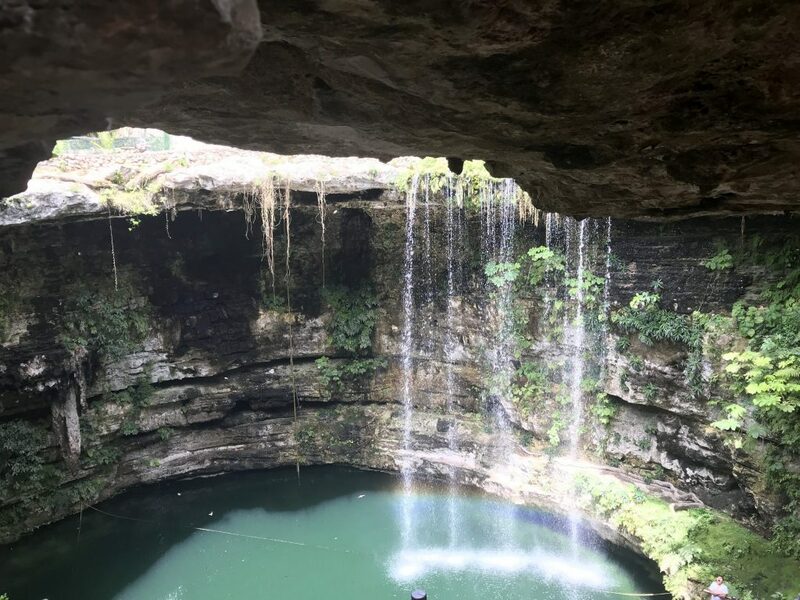 Much of the Yucatan Peninsula is dotted with cenotes (seh-no-tays) – round, fresh water tunnels or caves that are so fun to explore and swim in. These cenotes are fed by an underground aquifer that overflows to create canals which flow to the ocean. The Fairmont is built at the edge of a series of canals, and you can even take one of the resort’s boats from the lobby to your casita. 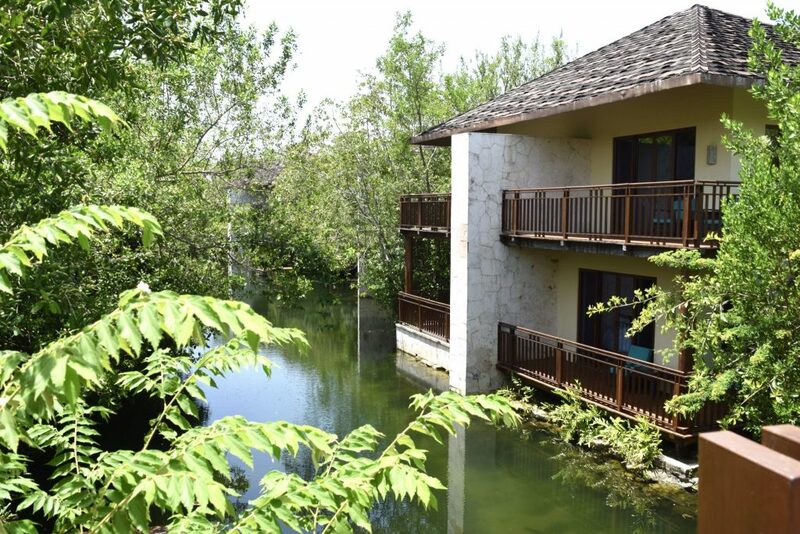 Most of the casitas at the Fairmont Hotel Mayakoba sit along beautiful waterways. Ours even had a private rooftop pool! From a least two different locations, guests can take a complimentary boat tour of the canals. This was a highlight of our trip, and the entire family still talks about that hour+ boat excursion. As we left the dock near the main pool and restaurants, our captain narrated the vistas. Our boat traversed though waterways both wide and narrow, and our favorites were deep crevices with fern-covered rock walls on either side. 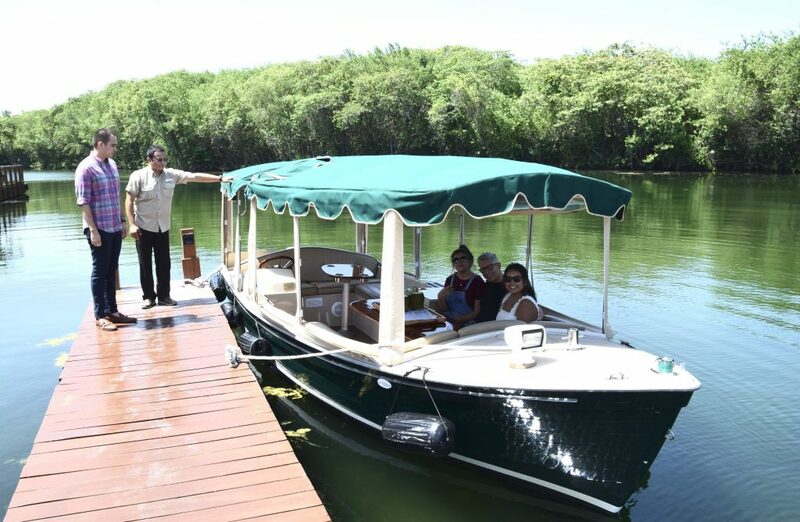 Our boat tour of the waterways that wind through the Fairmont Hotel Mayakoba was a fun way to see the natural flora and fauna of the area. Along the way, we saw plenty of iguanas. 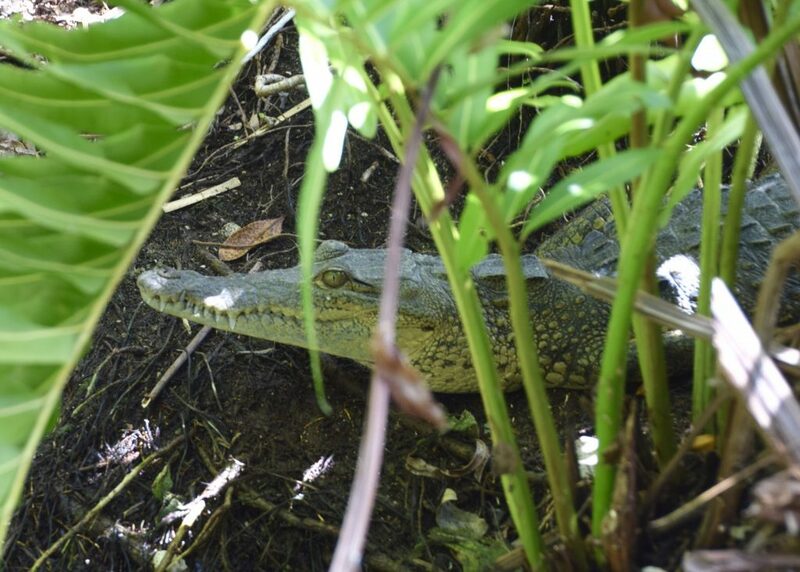 But we also saw a young alligator, dozing in the jungle grasses at the water’s edge. We ventured close enough for photos, but not too close! There was also a wide range of tropical birds, colorful fish and plenty of turtles to entertain us along the way. Far from the hotel along the waterways, we spied this little guy from the boat. 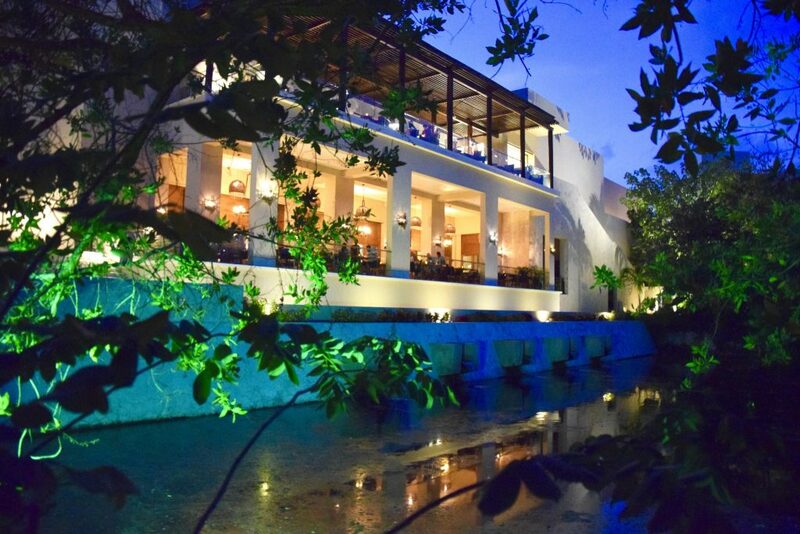 The Fairmont Hotel Mayakoba is laid out across it’s many acres, woven into the natural environment. All the rooms are either private or semi-private casitas. Our room was enormous, with a living room large enough for the pull out bed and a cot for the kids. (For some dang reason, these girls refuse to sleep in the same bed – something about Ava being a kicker). The master bedroom and two bathrooms were equally spacious – I mean really large. 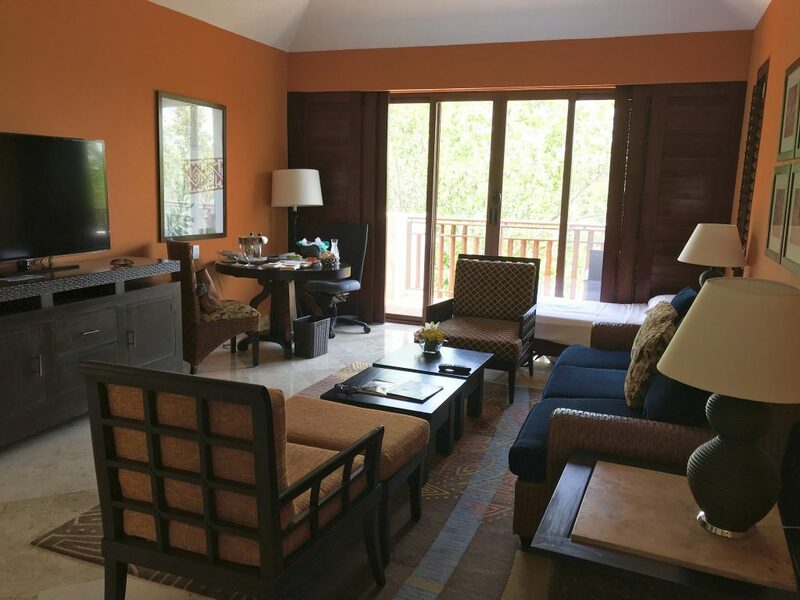 The spacious living room in our casita at the Fairmont Hotel Mayakoba – plenty of room for the girls to avoid each other! On our private deck, there were stairs up to the roof level. When we explored this space, we found a giant area for sunbathing or shade and OUR OWN DIPPING POOL! On the roof! Overlooking the beach and ocean! 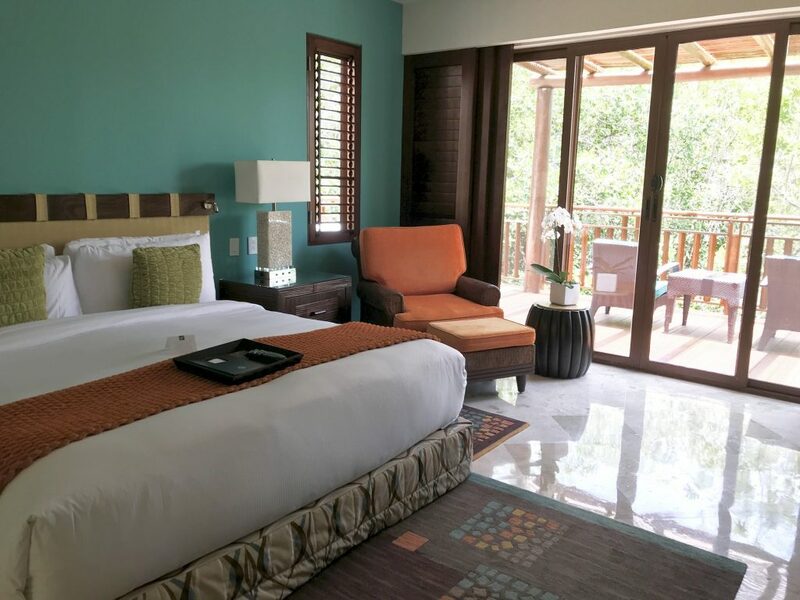 Bigger than our bedroom at home, this gigantic master bedroom in our casita at the Fairmont Hotel Mayakoba opened on to a wrap-around deck overlooking the waterways. There was another guest room underneath ours as part of our semi-private casita, with views to the canal. I don’t think there were guests staying there during our visit, since we never saw other people coming or going. 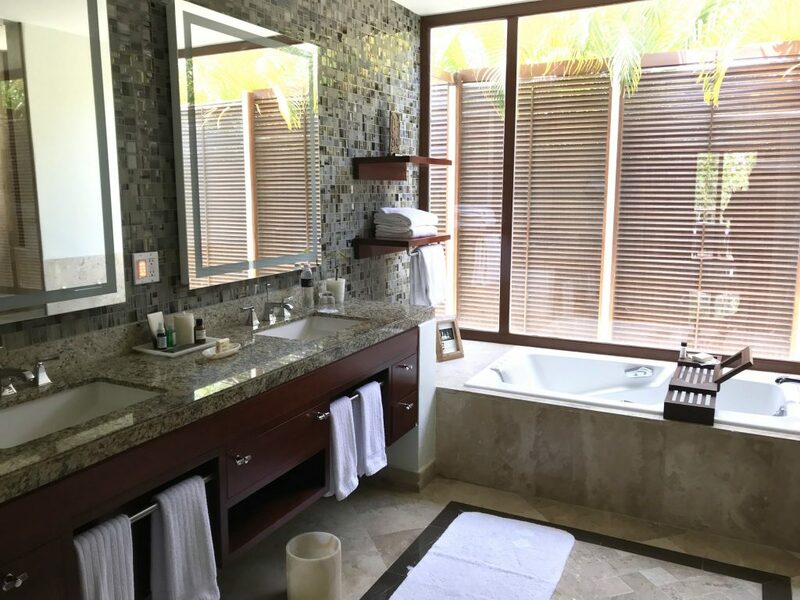 Even our master bathroom at the Fairmont Hotel Mayakoba was enormous, complete with soaking tub and huge shower. Since our girls are now teens, we are afforded a small amount of time without them. They are old enough to get themselves to the pool and back, or stay in the room unattended for longer periods of time. 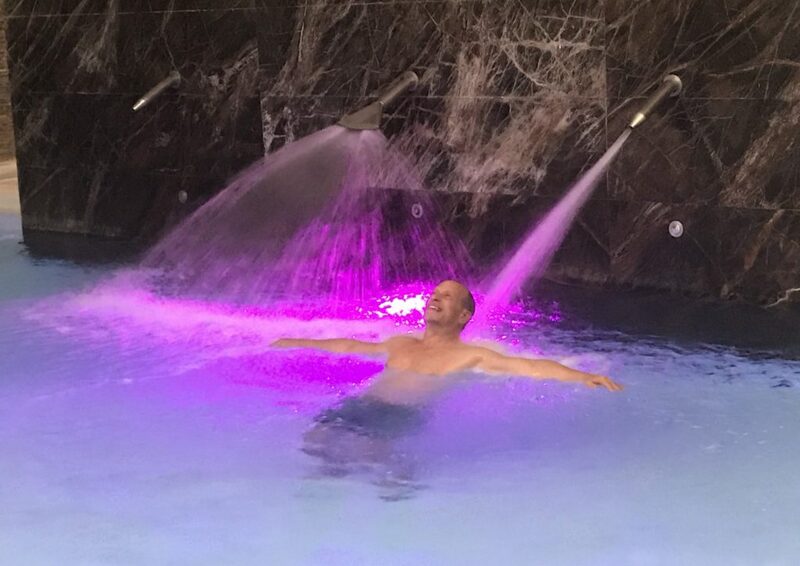 Because of this, we headed to Willow Stream Spa on property, and are so glad we did. 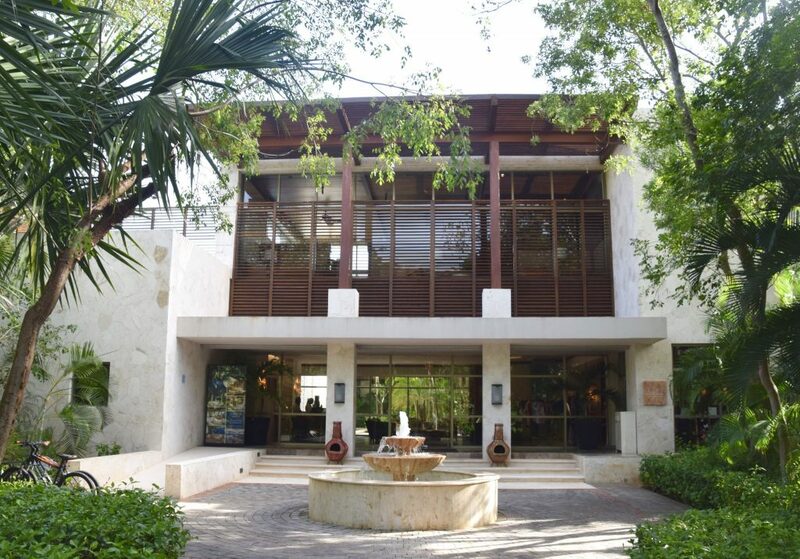 The front entrance of the Willow Stream Spa at the Fairmont Hotel Mayakoba beckons us to relax and enjoy. 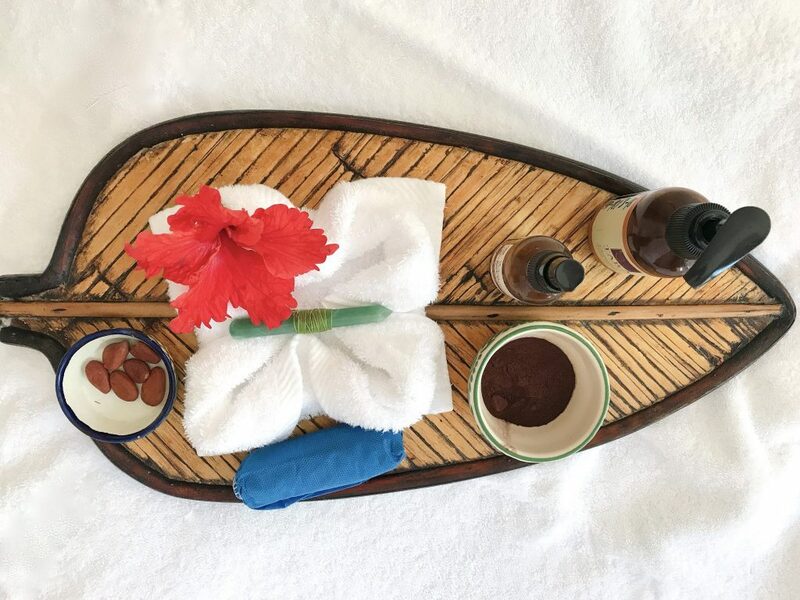 We both tried the signature “Chocolate – Food of the Gods” Massage, where a special blend of Mexican chocolate beans are ground into a paste. Spread onto your body, the chocolate makes you smell like a giant Kit Kat bar. 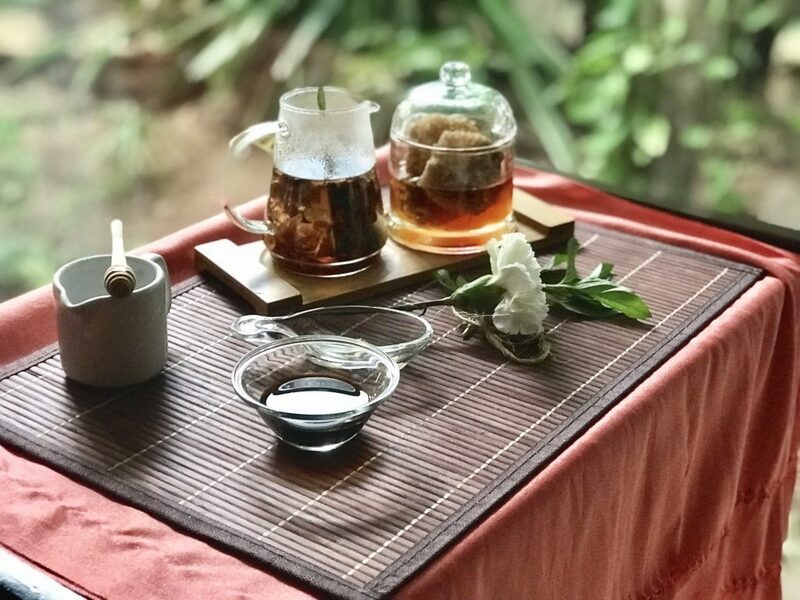 Evidently, the spa’s special blend helps your skin sluff off the old and bring forth the new. After rinsing off my candy bar coating in the in-suite shower, I must say my skin did feel great. This was followed with a more traditional massage treatment that included the scalp, which I love. 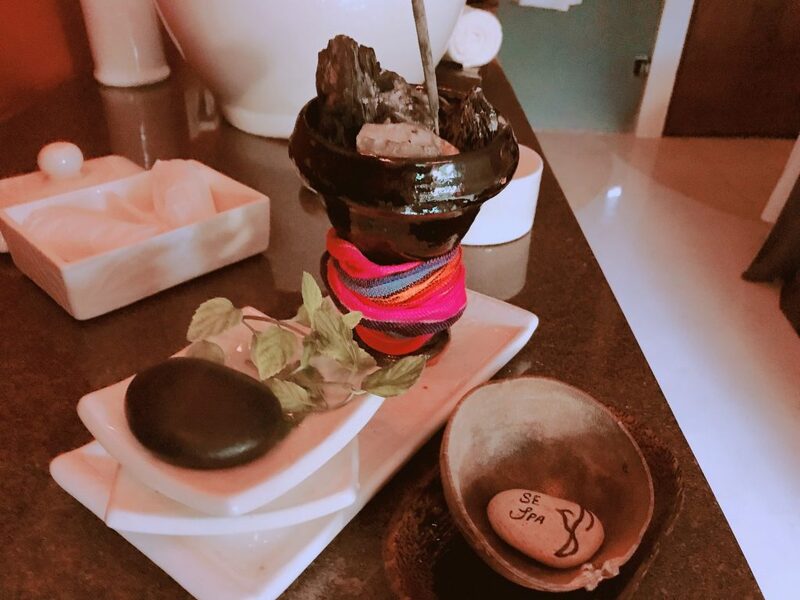 We loved our Chocolate – Food of the Gods massage at Willow Stream Spa at the Fairmont Hotel Mayakoba. 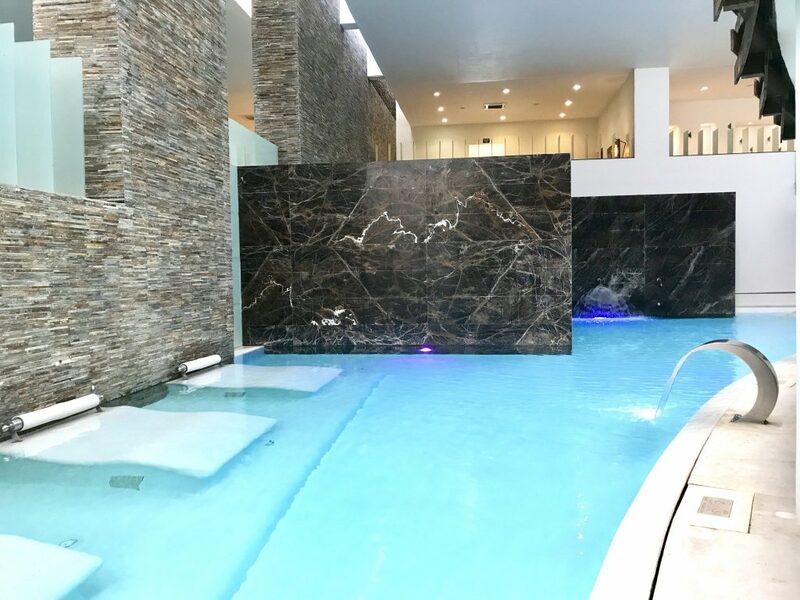 In addition to treatments, the spa has a fantastic workout facility including daily yoga and other group exercise options. 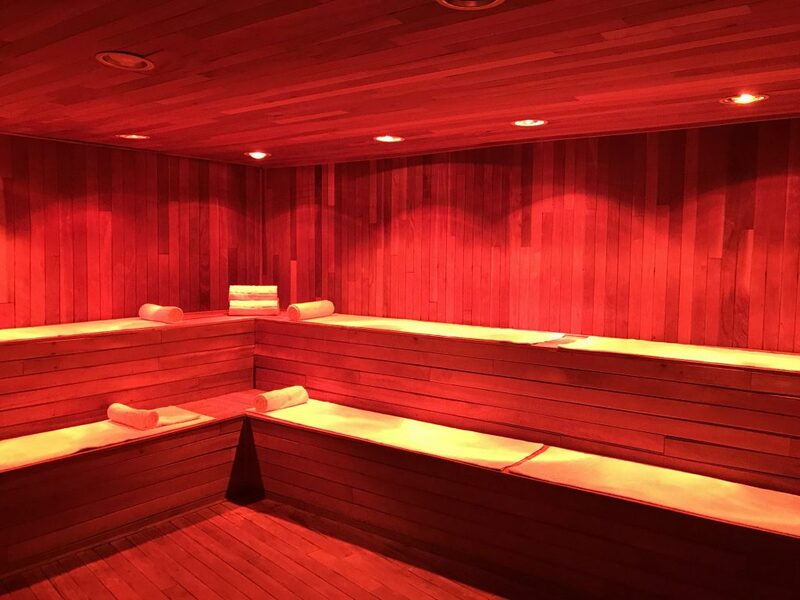 There are wet and dry saunas as well as separate whirlpools for men and women. On the spa building’s roof, there is another giant pool for relaxing or swimming laps. Very impressive and well-designed complex. The Fairmont Hotel Mayakoba gets five giant stars from our family. ‘Nuff said. Go!